Persistence Market Research’s latest report titled ‘Chilled Soup Market: Global Industry Analysis & Forecast 2017-2025’ extensively studies the global chilled soup market over an eight year forecast period 2017 – 2025. The global chilled soup market report has relied on important metrics such as absolute and incremental dollar opportunity, Y-o-Y growth and CAGR to produce a comprehensive report that should benefit all important stakeholders in the global chilled soup market. The report begins with an executive summary that provides a general overview of the global chilled soup market. The most important drivers, restraints, and trends and some relevant statistics such as the market value in U.S. dollars and volume in terms of millions of units have been mentioned. The summary also sheds light on the overall market approach that can be adopted in the global chilled soup market. This includes the products and regions to target with a differentiating strategy to truly stand ahead of all competitors. Certain acronyms have been used and assumptions made while preparing the global chilled soup market report. These have been adequately explained in their own separate section to avoid any sort of confusion. Readers are advised to browse this section before reading the global chilled soup market report. Persistence Market Research has devised a research methodology that stands head and shoulders above its nearest rivals and can be considered an industry leading approach to research. The analysts begin with exhaustive primary and secondary research to understand the global chilled soup market. A market player list that comprises every node of the value chain is developed and a questionnaire is prepared that assists in the extraction of all necessary data concerning the global chilled soup market. After the information has been collected, it is thoroughly validated using the triangulation method wherein primary and secondary data are merged with Persistence Market Research analysis. The final data is then examined using proprietary, advanced tools to gain all possible qualitative and quantitative insights into the global chilled soup market. An important section of the report focuses on the market dynamics of the global chilled soup market. The drivers, restraints and opportunities that are predicted to shape the global chilled soup market till the end of the forecast period have been mentioned here. The value chain that gives an accurate representation of the relationship between raw materials, manufacturers, supermarkets, restaurants and consumers follows this section. The profit margin that each node of the value chain can expect in this industry is briefly mentioned here. This is complemented by the global chilled soup market competition and threat section that provides extremely critical information for new entrants seeking to enter the global chilled soup market. While entry barriers to the global chilled soup market may be low, a high capital investment is required, which needs a sound strategy to succeed. However, the potential windfall can be truly enormous. The market analysis and forecast section of the report highlights a few of the global trends in the chilled soup market. A pricing analysis for the pouch, cup, tetra pack, and pet bottle has been given in terms of U.S. dollars for 100 grams. Some of the famous branded products and their current price range in both Europe and North America for different forms and sizes allow readers to make a comparative analysis. The report then moves on to classifying the global chilled soup market on the basis of packaging type, distribution channel, and region. 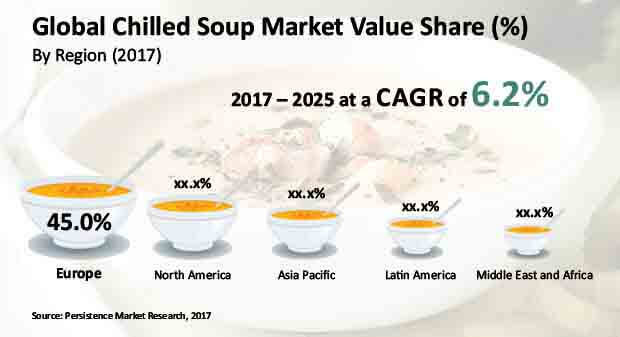 The global chilled soup market has been segmented into five major geographic regions for the purpose of this study – North America, Latin America, Europe, MEA, and APAC. Each region has been given its dedicated section wherein are mentioned vital statistics of the most important countries. The CAGR allows readers to get an idea of where the regional chilled soup markets currently stand and where they are anticipated to be at the end of the forecast period. Competition analysis is vital in any industry and this holds true in the global chilled soup market as well. The concluding section of the report profiles the key players currently operating in the global chilled soup market. The report touches upon important information related to the companies such as recent developments and strategies adopted by them in the global chilled soup market. It is highly recommended to read this section as each player has their respective strengths and weaknesses. Only by understanding these can new entrants hope to succeed in the global chilled soup market. Frozen foods are rapidly gaining acceptance across the globe, boosting the prospects of the global chilled soup market. Manufacturers are racing to cater to this demand by unveiling frozen confectioneries, yogurts and other snacks. A number of companies in the global chilled soup market have come out with fruit-flavored soups to encourage their consumption as a healthy and tasty snack. The companies have positioned drinkable chilled soup as a form of cold press, sweet tasting soup. Consumers seem to have different preferences though, and they seek out vegetable or even savory options in order to reduce their sugar intake. A large percentage of sales in the global chilled soup market is via the organized retail format. With the growth of the global economy, the retail chain has boomed and this has driven the chilled soup market in both developed and emerging economies. Retailers have begun to create their own chilled soup brands with various flavors to support the global chilled soup market growth during the forecast period. Some examples of this include supermarket majors such as Tesco, Sainsbury’s, and Woolworths Ltd. Even Marks and Spencer has three chilled soups sold under its own brand. These are French Onion, Butternut Squash, and Pea & Ham soup. In the U.K., Tesco had more than 3500 outlets distributed across the country in 2015. Tesco alone accounted for almost 1/5th of all grocery sales by value. In a number of countries such as Brazil and China, the distribution network of the local chilled soup market is quite weak. Manufacturers rely on selective distribution channels such as specific retail outlets or online selling to cater to a maximum number of customers. In addition to this, chilled soup is comparatively more expensive than traditional soup and it has a lower shelf life of less than 50 days. This is expected to be the biggest restraint in the global chilled soup market. Supermarkets are the most popular distribution channel in the global chilled soup market because they permit manufacturers to provide diverse soup varieties under one roof with improved shelf space and visibility, overcoming distribution and shelf life concerns. In 2016, ZÜPA NOMA launched a ready-to-drink, organic chilled soup in 1000 stores across the U.S.
Revenue contribution from the chilled soup market in Europe to the global chilled soup market is anticipated to remain comparatively high throughout the forecast period. This may be attributed to an increasing consumer demand for on-the-go breakfast products, which is expected to support revenue growth of the chilled soup market in Europe. By the end of 2017, the Europe chilled soup market is anticipated to account for 45% share of the global chilled soup market in terms of value. With a 220 BPS gain and a Y-o-Y growth of 7.2%, manufacturers would be well advised to focus their attention on this part of the globe. In 2016, the Europe chilled soup market was valued at a little over US$ 350 Mn and this should reach about US$ 625 Mn by the end of 2025 due to a relatively high CAGR of 6.8%. An absolute dollar opportunity of approximately US$ 18 Mn can be exploited in 2017 over 2016 with an incremental opportunity of over US$ 255 Mn between 2017 and 2025. Within the Europe chilled soup market, the U.K. is the main market to target as it has a high CAGR of 8.1% in terms of value.